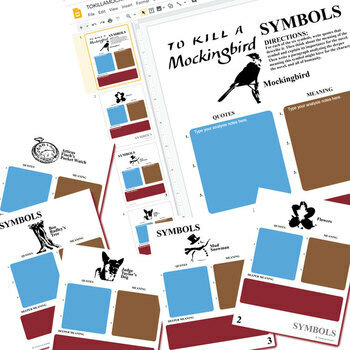 Our To Kill a Mockingbird Symbols organizer helps learners work through a difficult subject. Using this sweet-looking graphic organizer, they will analyze 6 key symbols/motifs from the novel. They will make note of 2-3 key quotes about each symbol. Then they will analyze what deeper meaning the symbol means in the novel. Includes 6 full-page versions for your preference or for Special Ed/RSP students. ♥ Challenging...but great to see my kids really analyzing symbolism. ♥ The symbols activity really pushed student thinking. My students were making amazing connections. The activity really assisted in creating in depth connections with the literature. ♥ Thanks for a clear format for kids to use to record evidence and analysis of symbols. ♥ Since I am terrible at finding symbols, this helped me more than the students. Then...it helped them! Thanks! ♥ Creative activity! Great graphics! Engaging for students! 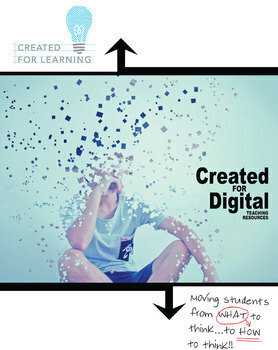 What is Created for Digital? ··· Our Created for Digital resources take all the trusted, quality instructional tools you know and love and convert them into the digital format you need for your online learners. ··· Instant saving ... students work in the file. ··· Microsoft OneDrive user instructions - a step-by-step visual tutorial. This will only take minutes! 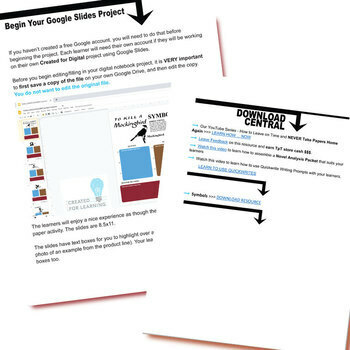 ··· All slides can be used over and over again. 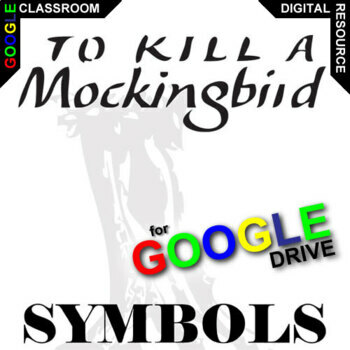 This Created for Digital resource will soon be able to be purchased as part of our TO KILL A MOCKINGBIRD Digital Unit Novel Teaching Package (coming soon...).. Enjoy To Kill a Mockingbird! Now go climb inside of their skin and walk around in it. > We've got 35+ more complete novel units for you, ready to save you precious time and sanity so you can have your life back to do what you do best ... teach! »»» Bored w/ Teaching GRAMMAR? > Introduce your learners to The Grammar Ninjas!